You remember them from 1963 as vividly as you remember breakfast – the Beatles, the Rolling Stones, The Dave Clark Five, Lulu, Dusty Springfield, the Kinks, the Animals – the great British music invasion of the 1960s. Oh, and there was Herman’s Hermits, too. The lead singer for Herman’s Hermits was the lovable, 17-year-old Peter Noone, and his story is the centerpiece of My Very Own British Invasion: A Musical Fable of Rock N’ Love, the new, loud, and brash musical that had its world premier Sunday at the Paper Mill Playhouse in Millburn, N.J. The performers have been tearing the roof off of the staid old theater ever since they hoisted the Union Jack across the stage and exploded into their first song. The just splendid British Invasion is a romping, stomping play about Mick Jagger, John Lennon and, most of all, Peter Noone. It has just about every hit song from England in it, including, thank you very much, a great medley of the Beatles work. Over the last fifteen years or so there have been numerous plays about musicians. Most of them fail. The ones that succeed are winners because they not only present the hit songs of the performer of group, but tell a good story. Remember The Jersey Boys? Beautiful, the Carole King play? The British Invasion has that in the love story between Noone and a girl named Pam (based on singer Marianne Faithful) and the love triangle formed because Pam also loves Trip (based on Mick Jagger). It is at times a sweet story and at times tempestuous, as all good love stories are. The play’s director, Jerry Mitchell, also directed The Jersey Boys. The play, a fictional story based on Noone’s life, starts in the Bag O’ Nails, a real, raucous London club populated by the British rock stars of the day. Noone, underage, gets in because he knows John Lennon, who immediately buys him drinks (two coca colas). 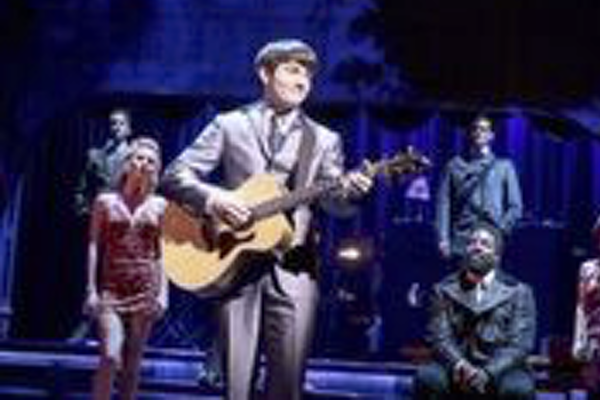 There, amid an uproar of music, and the Beatles medley, he meets gorgeous Pam, an eighteen-year-old singer looking for fame and fortune, as they all are. Noone’s problem is that Pam is in love with Trip, a singer who is an explosion of both music and personality. Who to follow, the raffish Trip or quiet, solid and charming Peter? Noone is jealous of the parade of Brit stars who go to America for tours in the mid-1960s and finally convinces his manager to send him, too. This is after Pam left for the states and her own tour. Here the Noone love affair with Pam is strained when he can’t find her and the shadow of Trip continually looms over both of them. Finally, Noone finds Pam, but so does Trip. Who does she end up with? That’s the story of the play. The story is so successful because book writer Rick Elice has made the characters of Noone, Trip and Rice (and others) deep, rich and captivating. They are complete people with all of their triumphs and tragedies. The audience can connect with them. Elice’s invasion story is a good one, too, and he tells it carefully. The play’s director, Mitchell, does a magnificent job of staging a musical that is not just about music. There are a lot of songs in the story but they do not overwhelm the lovers. The successes and failures of the lovers do not overwhelm the music, either. People will probably go for the music and wind up enjoying an involved love story, too. Mitchell very delicately both merges and separates the two. The performers are quite good. Jonny Aimes is just adorable as young Peter Noone. You so want him to wind up with Pam. He sings many of the Hermits songs, such as “Mrs. Brown, You’ve Got a Lovely Daughter,” and “I’m Into Something Good.” Ironically, Noone seems to have hated his biggest hit, “I’m Henry the Eighth, I Am” and cringes whenever people make him sing it. That’s the one song for which he will always be remembered. Equally good is Conor Ryan as Trip, who bounds about the stage with endless energy and can sing up a storm. The third part of the love triangle, Pam, is played with great emotion by Erika Olson. She does some nice ballads and rock the room when called upon. John Sanders a solid agent Fallon. Daniel Stewart Sherman is The Hammer, a tough guy (anyone nicknamed the Hammer has got to be a tough guy). Travis Artz is a funky Ed Sullivan and Gemma Baird is enchanting as Peter’s mom. They are surrounded by a brilliant ensemble cast of actors/singers. The choreography by Mitchell is very good. The theater rocks all night. Some of the songs are “For Your Love,” “She Loves You,” “Go Now,” “I Want to Hold Your Hand,” “Don’t Let the Sun Catch You Crying” and “House of the Rising Sun.” Not enough for you? How about “Let’s Spend the Night Together,” “Time of the Season,” “There’s a Kind of Hush (All Over the World),” “In My Life,” “She’s Not There” and “I Only Want to be with You,” the hit by the love of my life, Dusty Springfield. The irony of the show, of course, is that these groups did not fade away in the ‘60s. They live on today through the radio and TV documentaries. The Rolling Stones are about to embark on yet another world tour, Paul McCartney is still a huge star and good old Peter Noone has his own show on Sirius radio. Why do they live on? It’s because, as the song goes, rock and roll is here to stay. PRODUCTION: The play is produced by the Paper Mill Playhouse. Set Design: David Rockwell, Costumes: Gregg Barnes, Lighting: Kenneth Posner, Sound: Andrew Keister. The play is directed and choreographed by Jerry Mitchell. It runs through March 3.